With 16Gbps non-blocking switch fabric, 8k MAC Address table and 802.3x full-duplex flow control, the GSD-800S offers wire-speed packet transfer performance without risk of packet loss. For efficient management, with its built-in Web-based management, the GSD-800S offers an easy-to-use and configuration facility. Via the WEB interface the GSD-800S can be programmed for basic Switch management functions such as per port speed duplex settings, Port Trunking, VLAN, Port Mirroring, Rapid Spanning Tree, 802.1X network security authentication and Misc Configuration. Additionally, the firmware includes advanced features such as IGMP snooping, QoS (Quality of Service), broadcast storm and bandwidth control, to enhance bandwidth utilization. To meet the growing network, the GSD-800S supports standard Simple Network Management Protocol (SNMP) and can be monitored via any standard-based management software. These features provide a cost-effective way to manage the devices from the Internet whenever you are at work or at home. All eight RJ-45 copper interfaces support 10/100/1000Mbps auto-negotiation for optimal speed detection through RJ-45 Category 6, 5 or 5e cables. The MDI/MDI-X auto detection supports wired connection to any Ethernet device without requiring cross-over cables. 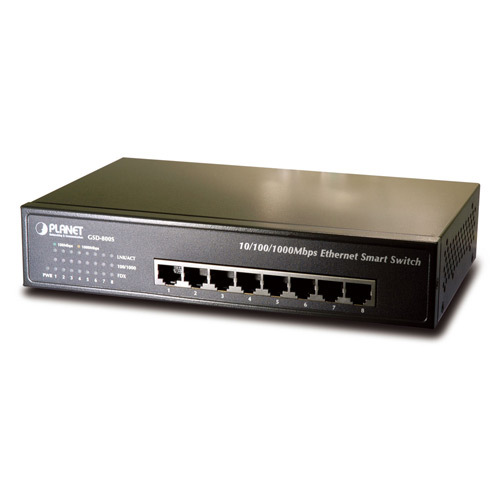 With a non-blocking design and desktop size, PLANET’s GSD-800S 8-Port Gigabit Ethernet Switch is designed to easily install a Fast Ethernet network, and it can be used to build a Gigabit high-bandwidth switched network quickly and easily. With support for VLAN and port trunking on the GSD-800S, users can directly connect to department switches or backbone servers. With 8 10/100/1000Mbps ports, the GSD-800S provides a cost-effective and high-performance solution for SOHO/SMB Departments and power users. In multiple applications, the advanced functionality of the GSD-800S eliminates traditional problems associated with Ethernet. Using the built-in VLAN functionality can segregate users and Spanning tree can reduce the loop occurence. – Auto-negotiation 10/100/1000Mbps full and half duplex mode selection. – Flow control disable / enable. 2011-06-15 1.31b110526 [Address Information] : modify PLANET Technology address information. (1) [RSTP] Fix RSTP incorrect issue caused by firmware version 1.2. (2) [IGMP Snooping] Fix discard IGMP packets which has checksum error on IP layer.